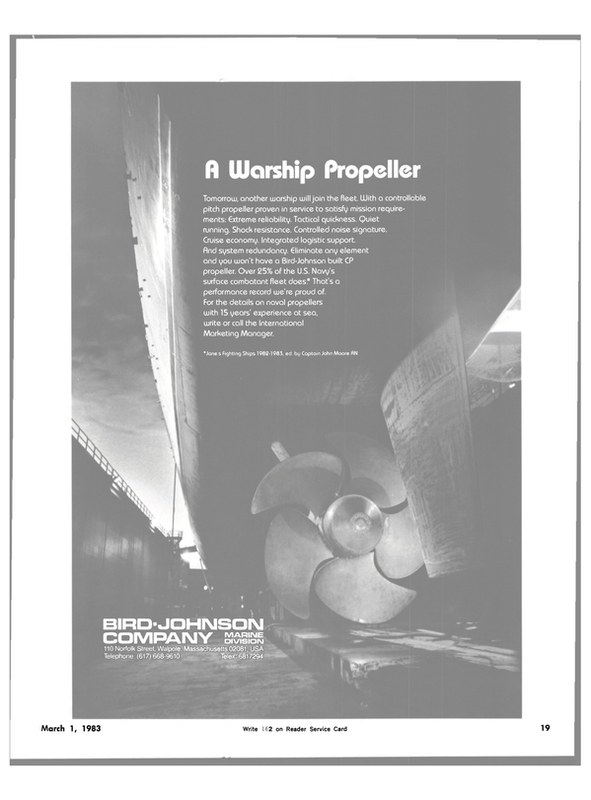 A new brochure is available from Raytheon Marine Company, Manchester, N.H., comparing features offered in their 1983 line of radars. Eight models are available, from Raytheon's compact 6-inch display 2600 MK III and 2800 MK II Mariners Pathfinder® R a d a r s with new expanded ranges, to the top of the line 10- inch display 1010 Mariners Pathfinder Bright Display Radar. With every purchase of a Raytheon radar, from February 1 to June 30, 1983, purchasers can receive free lifevests, either three adult and two children Type III USCG-approved PFDs, or three commercial Type I USCG-approved PFDs. "Raytheon has always provided the highest quality of a large selection of radars designed to suit every boatowner's needs," said Raytheon Marine Company's Stanley Clark. "Our free-lifevest offer this spring is one more expression of Raytheon's commitment to helping boatmen maintain the greatest level of safety in all kinds of weather." The b r o c h u r e details Raytheon's new 1010 radar offering, for the first time, a 10-inch radar with digital bright display. This, and the many new and popular models are described. The free lifevest offer is available through participating Raytheon dealers in the U.S. and Puerto Rico. Raytheon offers a two-year limited parts warranty with one-year free onboard service from any of the company's U.S. dealers and worldwide service network. The four-page Raytheon Radar Comparison Brochure includes model dimensions, ranges, suggested prices, a listing of participating dealer locations, and lifevest offer information.